So I’m still at kitchen renovations, looking at the plan of kitchen cabinets and measuring and figuring and measuring. R is plodding away at putting together cabinets. Today he’s a little sore from sitting on the floor and putting them together but a trooper as he is (he’s reading about the 442nd in WW2) he sits down and does some more. So R and I go to Home Depot, get the sink, 2 more cabinets, and think about getting some lumber too. Nah cannot fit anyway. Next trip we go get the lumber On our way home, it rains a little, we get home in the garage and it starts pouring cats and dogs. Thank you God! So, R starts putting together the new cabinets. All cabinets a put together waiting to be installed. I, on the other hand, am tired from thinking and take a nap ( isn’t that what bosses do?). After nap, R says he’s done and don’t know where to put stuff. It dawns on me to try fit the stove top into the cabinet, just to see how it looks. It doesn’t fit. It’s just a 1/2 inch too small. My hopes are dashed and my mind is racing. Dear ol hubby says, that’s okay we have enough cabinets, we can use this someplace else right? I did have enough and that was an extra one thinking the 36 was too big. Back to the original plan. I’m exhausted and it’s time to make dinner. Tomorrow we break down old cabinets and make walls. Sounds like fun huh? The week is half over, wall still not up, cabinets waiting for their place on the wall, mind keeps thinking about materials, cabinet placement, wall construction, measuring tape in, measuring tape out, guess it’s time to go shopping! 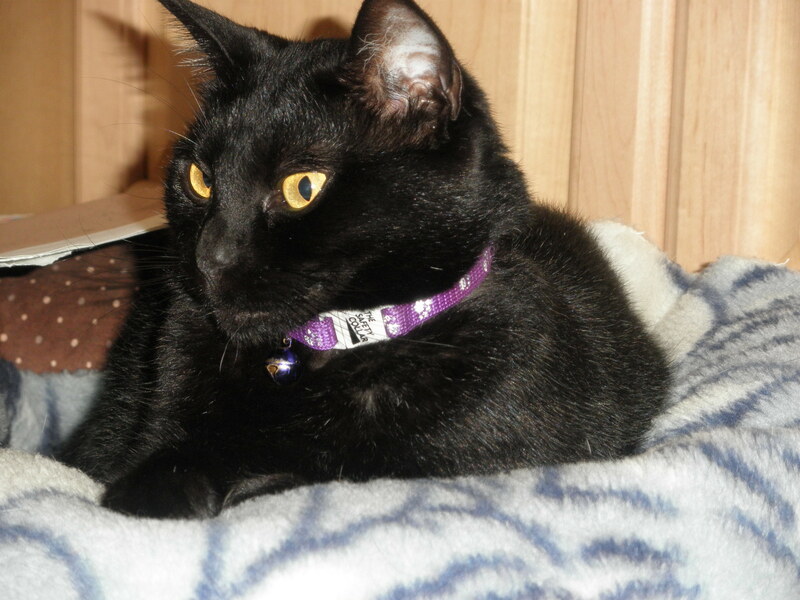 This is what Blackie thinks of the whole thing, ho hum, moving stuff around again. New web address, new name, change is soo hard. Seems my windows live blog will now be here anymore and they have me going to another blog site, wordpress.com. Change is so hard and sometimes reading instructions is also soo hard. So keeping with the change theme, I changed the name of the blog site to Sandy’s Sewin’. I think it’s kinda catchy and has a new feel to it. And since I cannot read instructions good, my site address is sandysewingmyblog.wordpress.com. I didn’t take off the myblog part so it’s part of my address. Such is life huh? Anyway, change the old happystitches site to sandysewingmyblog. 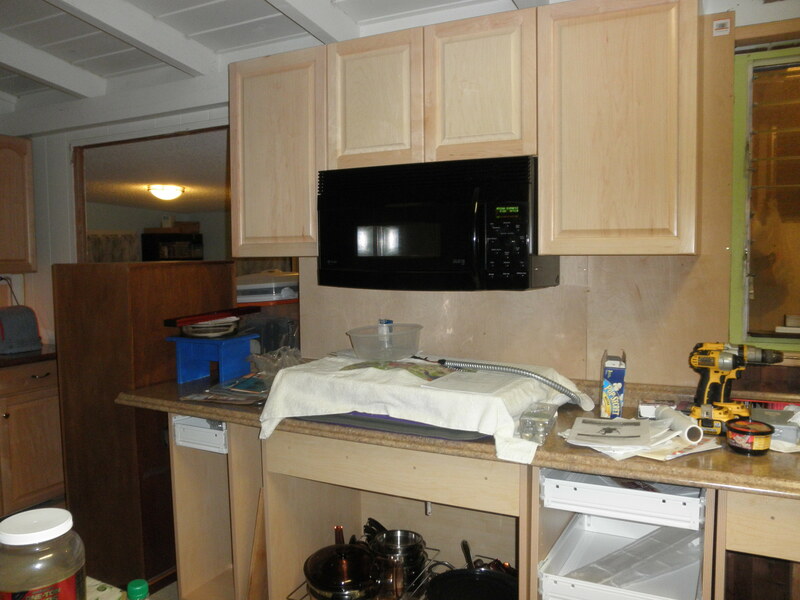 All the upper cabinets have been removed, just the sink and the cabinet to the right are left. Next is building a wall. 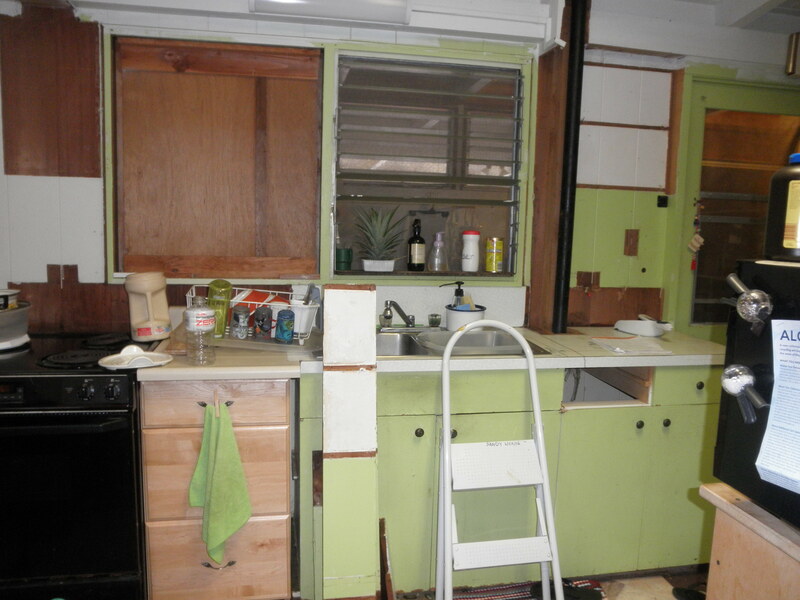 Veering away from the sewing theme, I have decided to start up the kitchen renovation. Especially since my whole family is telling people that yeah we have a half finished kitchen that my mom/wife started. And seeing that friday is a furlough friday, and seeing that I go on standby next week already, this just felt like the right time to start up again. I tried to get help from my friend, but he was busy working. Asked Roger if he could built the cabinets (kit kind) since he is good with reading instructions (unlike me). That has worked out good. Roger made these 2 so far, he's so good at following directions. 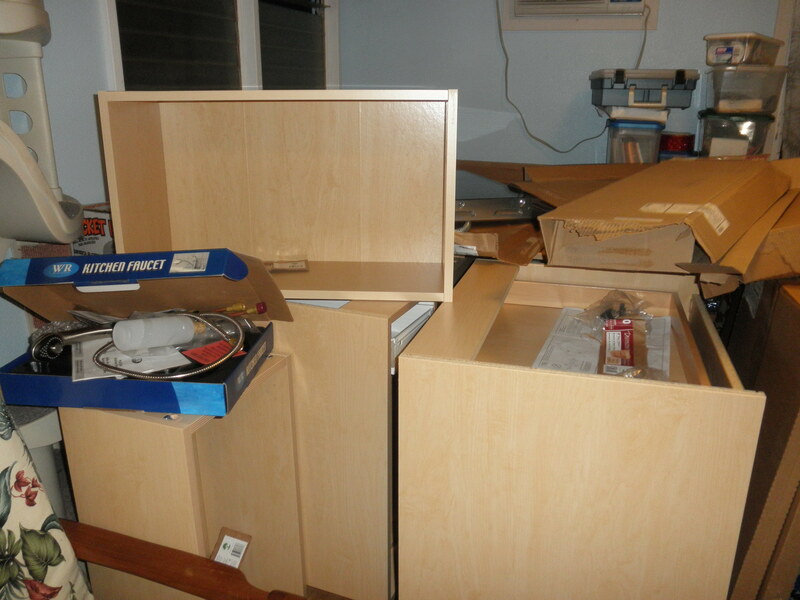 So, today is day 1 and he put together some cabinets and I did some demolishing ( I like that part). 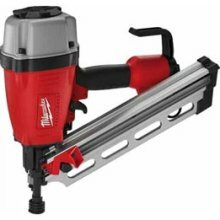 Only thing now I have to think how to make a double wall out of a single wall and where to put the studs so it’ll hold up the new wall micro (that we’ve been using on a cart). Tomorrow I go to HomeDepot and buy some lumber, kitchen sink, countertop (interim before getting the granite). Looks like rain so pray for sun tomorrow! By the way, did I say that this all started with a water leak under the kitchen sink? And that it looks like it’s been leaking for a while? Anyway it was a good catalyst to start up again. OOOOOhhhhhh time just flies by when you’re doing nuttin! Lets see, it’s been 2 months; 33 miners saved; 1 new mayor elected; been trying to exercise regularly (no can do); watched the new Hawaii 5-0 and didn’t like it; embroidered bowling shirts for my sister (she thinks it’s so easy! ); took care of Kawika when Dawn went to Vegas for a week (we had a good time and so did Roger, since they did the boys thing); bought more material; didn’t sew much but got material! ; and, survived standby the first half of August and the second half of September. Well, that’s 2 months in a nutshell, been watching the rescue of the Chilean miners all last night, it was amazing what people can do when they put their mind to it. I did do some sewing in September, I’m fixated on reusable fabric shopping bags. And the fabric that I said I bought was so cute. Took be a while to inspect other bags, sew some up, make some patterns and finally come up with a pattern that resembles those bags you get from the grocers. I made Jill one and she wanted another style "so she could put it over her shoulders" . This is the one I made for her. And the next pic is how it closes up. Pretty neat huh? Did I say that I also found time (I’m not as busy as I sound, I really like laying around doing nothing) to do an electrical job. Seems a friend from church’s son bought a house, a fixer upper type. He could do a lot of stuff but not the electrical. Sounded like a small job, replace the old electrical panel for a bigger one. I ended up almost rewiring the house. This house was a real fixer upper, seems the old owner did a lot of electrical jobs by himself, I hate those Home Depot videos, so most were below par. Won’t bore you with all the technical jargon but I spend at least 4 days in the attic, which was more like a crawl space. I proud that 1) I didn’t fall through the ceiling 2) I could actually move around and figure things out 3) I didn’t fall through the ceiling. I finally got help, asked an apprentice at work if he wanted to work with me. He said okay and that worked out really well. I think a couple more days and I’ll be done. Whew, on to the next job. Work has been pretty much, how do I say this? Drama! They talk about women but men must be the worst. They talk about each other; make sarcastic remarks to each other even me; plot and plan; think of ways to ditch work; and always talk about football bets. I put my ipod on and do my daily crossword or surf the internet. Such is life working with the lesser of the species. the more I work with men, the more I believe we women are the superior gender, and my friend Kat will attest to that! Well, I’m looking forward to the holidays but not the pounds. Looking forward to seeing Alegria (Cirque du Soleil) this sunday. Roger and I are treating our whole family, mom and sis, kids boyfriends, cuzin Ern, and aunty and uncle that lives down the street. 15 tickets for 800.00 some odd dollars. Could have blown Roger down with a feather. But after that shock, he was okay with it. I’m also refurbishing a camper top for my truck, fixing the window and cleaning it up (been sitting in my front yard for about 8 months now), just have to figure out how to get it up on my truck, that’s for another day. Will take more pics of projects, just have been lazy. Happy Halloween & happy autumn!